CompanyStructure - Stivala Group Finance p.l.c. The Group conducted a re-organisation over the course of 2016 and 2017 in preparation of the Bond Issue. ST Hotels Ltd (C 78678) and ST Properties Ltd (C 78261) were established as private limited liability companies on 16 December 2016 and 23 November 2016 respectively as subsidiaries within the Group and which have the majority of this shares indirectly owned by the Issuer. 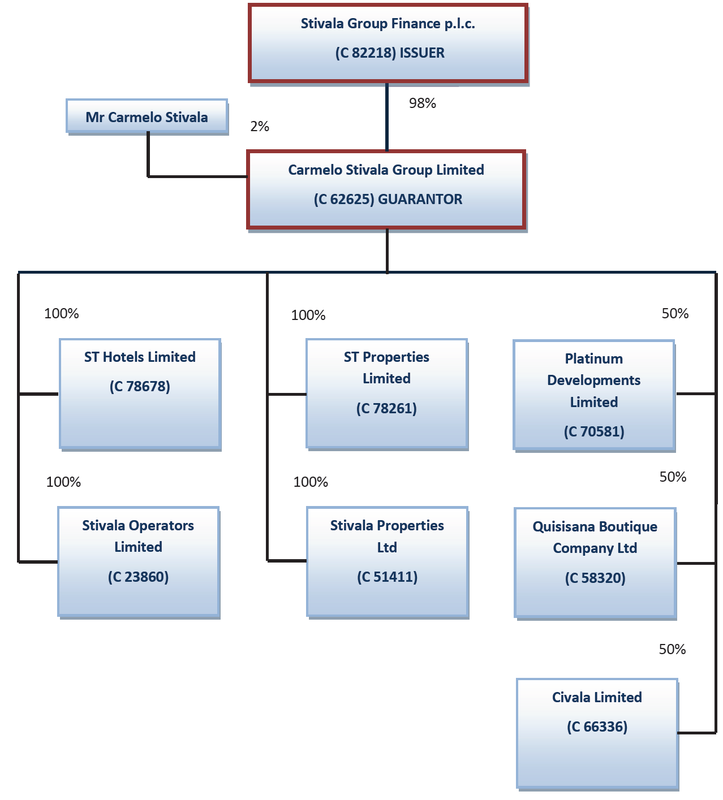 The initial step in the restructuring process entailed the transfer of operations from Stivala Operators Limited (C 23860) and Stivala Properties Ltd (C 51411), these being subsidiary companies of C. Stivala & Sons Limited (C 4510) (a company which is not reflected in the above chart), to the Group. As such, ST Hotels Ltd acquired from Stivala Operators Limited the business, operations, assets and the benefit of all contracts previously pertaining to Stivala Operators Limited, with effect from 1 January 2017. Furthermore, ST Properties Ltd acquired from Stivala Properties Ltd the latter’s business, operations and assets with effect from 1 January 2017. Accordingly, as from 1 January 2017, Stivala Operators Limited and Stivala Properties Limited ceased all trading and operating activities and it is intended that both companies will be liquidated in the near future. own name and for its own risk and benefit. The Group also has two operating associate companies, both of which are involved in the Group’s main activities of leasing commercial and residential properties. Platinum Developments Ltd (C 70581) owns and operates leases of three residential units and one office on the Sliema Seafront, whilst Quisisana Boutique Company Ltd (C 58320) is engaged in leasing residential and commercial properties to third parties. It operates a block of 18 apartments, 37 garages and one office situated on the Qui-Si-Sana Seafront in Sliema. A third associate company of the Group, Civala Limited (C 66336), has yet to commence operational activities.